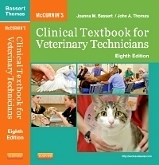 A fundamental text in the field of veterinary technology, McCurnin’s Clinical Textbook for Veterinary Technicians, 8th Edition has the trusted content, simplified layout, and novel study tools every Vet Tech needs. Sections on small and large animals, birds, reptiles, and small mammals embrace every aspect of the veterinary field, while case presentations of actual patient situations link information to relevant, real-life scenarios. This color-coded, fully illustrated guide will give you a leg up in the constantly evolving Vet Tech field.